Prepare a 9" square bake pan with non-stick pan release. 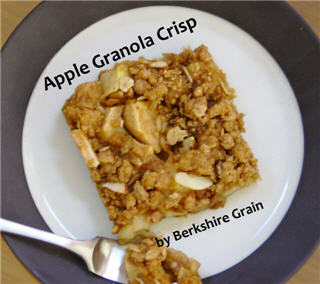 Combine first 5 Crisp Topping Ingredients in a small bowl. Place all Crisp Topping Ingredients including Earth Balance Spread and Granola into food processor and pulse until all is thoroughly combined into a coarse and crumbly mixture -- DO NOT OVER PROCESS....then set aside. Peel, core and slice the apples and place into the prepared 9" bake pan. Place the Granola Crisp Topping over the apples. Bake at 375 degrees Fareheit for 20-25 minutes, or until the topping is golden brown.